Another passion of mine is being a champion for positive self image. My generation, and younger is consumed with social media and it creates a false sense of reality, especially for young girls. I would love to see a movement where accomplishments get just as many “likes” as beauty shots. I think, as women, we should be allowed to embrace what makes us beautiful, but it shouldn’t be the only thing that we are valued for. If I continue to be influential, I’d like to work on a movement with these principals. 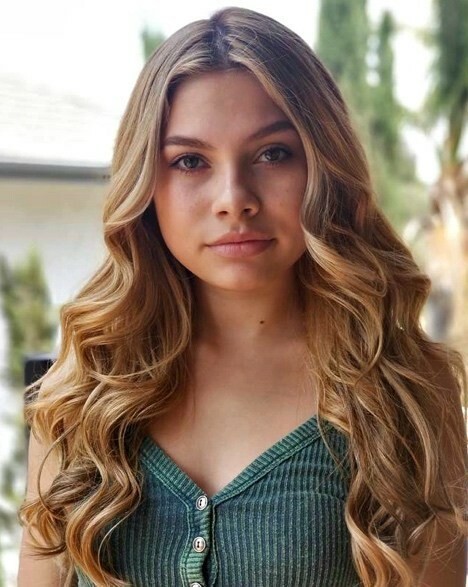 I had the pleasure of interviewing Bella Shepard, actress on Brat’s ‘A Girl Named Jo’ and ‘On the Ropes’. I’m from Michigan and it was actually a fluke that I got involved in acting. My grandmother noticed an article in the paper that was looking for extra’s to be in a movie called “Oz the Great and Powerful” with James Franco and Michelle Williams. We didn’t go to the casting, but because my grandma knew that I loved The Wizard of Oz so much, she just sent in a photograph of me. 4 months later, casting called telling my mother that I had been chosen as one of 12 kids out of hundreds! During the shoot, the Director, Sam Raimi, asked me to say a line. After that, I was a SAG actress! I didn’t even know what that was! Sam Raimi literally changed my life and he doesn’t even know it! There is a picture of us online from an entertainment magazine where we are onset and he is holding my hand. I still have that picture. I think the fact that I never even knew that I could “be” an actor is so interesting. I never dreamed that I could make a living doing something that I really enjoy like this. I was a competitive gymnast and dreamt of going to college for gymnastics. I injured my knee unexpectedly which gave me the free time to do the film. It was all very much fate. After I decided to continue acting, I came out to LA to try auditioning. On my very first audition, I was beyond nervous and completely messed up my lines. I think I was literally trembling. Luckily, the show was a scary show, where the character was supposed to actually be scared. I ended up booking the role! In life, you never know where fate will take you. I firmly believe it’s our jobs as humans to just take constant leaps of faith and step out into new experiences. You just never know where you will end up! From one injured knee, and one mistake in an audition came my entire desire to be a working actor. My mom and I still laugh about that day. I came out of the casting office practically crying, then they called saying I booked the job! I just wrapped a new series called, “On the Ropes.” I play Jackie, she’s a girl from the wrong side of the tracks. She meets a guy who is a great student and has his life together. Jackie introduces him to the underground world of gambling and boxing and their character’s take several dark turns during the season. It was fascinating because it stars a young professional boxer named Ryan Garcia who had never done any acting. He was fantastic to work with. Also, when people see the boxing scenes, they will appreciate his skills! I still look back fondly at Michelle Williams from Oz the Great and Powerful. She was incredibly sweet. I also wrapped an episode of Grace & Frankie last year and I got to meet Jane Fonda and Lily Tomlin. Both were beyond professional and approachable. I seriously want to be THAT type of actor, with an incredible history, body of work and the respect of my peers, but also kind to all. I just worked on an episode of Orange is the New Black and the director was Laura Prepon who is also an actor on the show, but she was on That 70’s Show first! I was fangirling the entire time! She is so talented, and because she was an actor, she made an incredible director. It was so inspiring working with a director like her. I feel strongly that you have to love the entire process of acting. You have to love class, and auditioning. The ‘acting’ is always fun, but you really have to love the process. If it gets to the point you don’t, take a break. A lot of people get frustrated because work isn’t always steady. Every actor has times when they aren’t working. In those cases, I think it’s a good idea to continue being creative. Artists need to create art. Work on an independent film, write, take a directing class. I’m only 17 so I know it’s easy for me to say, but that is how I plan on handling the downtimes. Keep your mental game strong. People don’t realize how much mental strength is needed in this business. I think I got a lot of that from being in gymnastics for so many years. Wow. This is a great question. I would probably do something with animals. I would outlaw factory farming of any kind, I would also love to see more animals integrated into our health care system. Puppies or kittens being mandatory at children’s hospitals, or retirement homes, or prisons. When we can love something, that loves us back, it is very healing. That ANYONE can do it. My example is that I never knew that it was something people do everyday! When we left to come to LA, everyone questioned my mother saying “What are you doing? ?” my mom simply said, “Why not Bella?” and I thought, “Yeah, why not me?” It seemed so simple, yet people act like it’s not a viable career. It is viable. Why not Bella? Why not YOU? That one scene can take hours to do! Haha! Not many people realize that a scene can take a long time. You also need to not lose the ‘illusion’ of the first time. That means, on take number 15, it has to look like you are saying your lines for the first time. It’s definitely not easy, but you learn to give a little less on scenes where the camera is not on you, and a little more when it is. I try to always be present for my fellow actors though. I will give them my full attention. That acting is not always glamorous. Haha! My friends all think it’s glamorous and I just run around to parties. It’s really difficult work. I can work as an adult now and that means that I can work 12 hours onset, or more. My call times are early, I leave late. I have to study my script when I’m at home and I have to put thought and time into each role. It’s a JOB. Like any job, it can be exhausting. But, it’s a job I love, so I’m lucky. My favorite quote is, “Everyone is a Genius. But, if you judge a fish by its ability to climb a tree, it will go it’s whole life believing it is stupid.” — Albert Einstein It just means that everyone has a gift to offer this world. If you try and make everyone climb the tree, the fastest swimmers won’t be discovered, you know? My mom said that I had to take an acting class before we could go to LA to even see if I truly enjoyed acting, haha. I said to my first teacher, Jerry Hayes “I don’t know about this theatrical acting, I think I only want to do commercials.” He said, “Well, why?” and I said, “I don’t like it.” And he said, “Ok, how much acting have you done?” and I said, “Well, none.” and he said, “Ahhh… interesting.” Within two weeks he had me do my first a dramatic monolgue and said, “Mark my words. You ARE a dramatic actress.” Without him, I would never have even given it a chance. He saw something in me that I didn’t even know was there. Sam Raimi to say Thank you!!! He truly has no idea how he altered my life. Thank you so much for joining us. This was very inspirational! Thank you for having me!